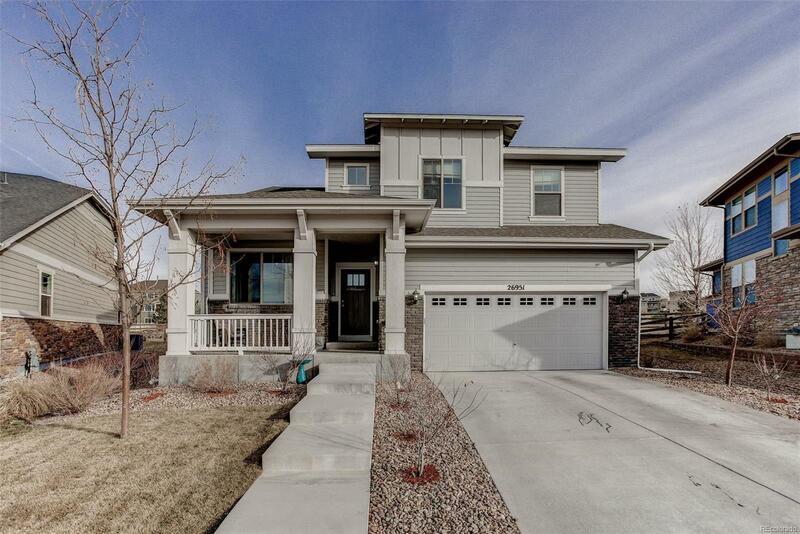 Walk to school from your new home in the Cherry Creek Dist. This west facing Bristol model by Village Homes is on one of the larger lots in Southshore. The oversized yard is great for entertaining and pets. Enjoy privacy with NO neighbors behind you. Enjoy upgrades like quartz countertops, maple espresso cabinets, gas double oven, updated tile, and a modern gas fireplace. The main level also includes newer solid Brazilian pecan flooring (2017), laundry room, guest bath, and large office. Discover a spacious master suite with a large walk-in closet, and two bedrooms for children or guests. The finished basement (2016) adds a conforming bedroom, flex room, 2nd living room, pre-wired 8.1 surround sound, wet bar, and a full bath. The 3-car tandem garage comes with plenty of overhead storage. Newer carpet (2017) throughout, plus 9' ceilings, satellite ready and ethernet throughout. Walk to Aurora reservoir with 10 miles of trails. Just 1 mile to e470, Southlands mall. 20 minutes to DTC.